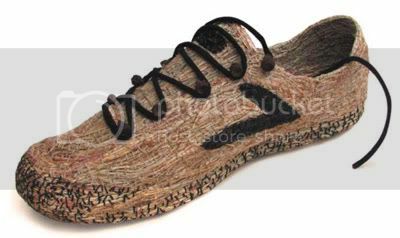 GRASS SNEAKER by Wendy Golden. Could these be the current footwear trend? 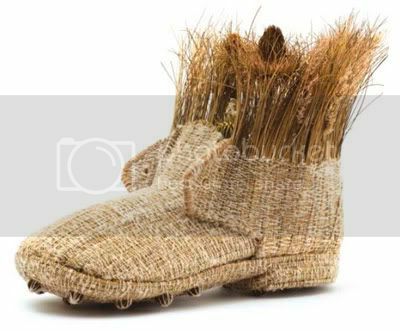 The 'Green' effect of materials used such as this 'Grass Sneaker' by Wendy Golden applied mixed grasses & linen thread on her work. INTRODUCING SPECIES Shoe by Beth Hatton. 'Introducing Species' shoe by Beth Hatton is based on convict's shoe pattern. "Convicts were the main source of labour for the early surveyors and settlers, and were given the really hard jobs such as working the surveyor's chains and clearing the bush. 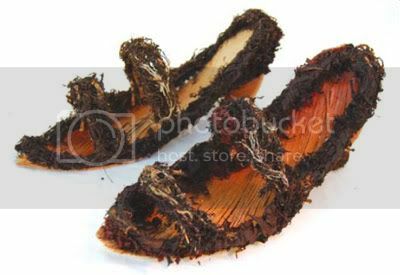 So I realised that convicts would have been the first to set foot in many parts of Lake George, and therefore one of their shoes could easily carry my ideas about the introduction of weeds to the early colony. By good fortune I came across Peter Sinclair who makes and wears replicas of early convict shoes. Using his pattern pieces I set about making my shoe with a mixture of indigenous grasses and some of Lake George's most pervasive weeds. As friends have commented, it is a clodhopper of a shoe yet still has a jaunty feel about t. The early convicts themselves were a cheeky lot. Not at all daunted by lowly position, they talked back to their masters., stole from them, got drunk and ran away at every opportunity. 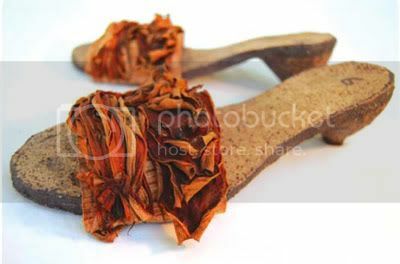 I like to think that their larrikin spirit expressed itself somehow in the making of my shoe." 3 Sets of FIBRE SHOES by Therese Flynn-Clarke. 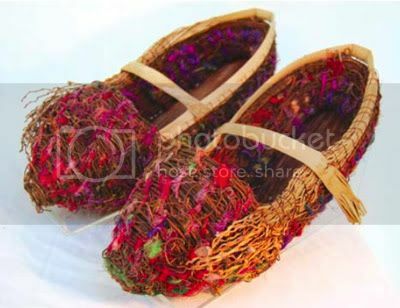 These 3 sets of Fibre Shoes by Therese Flynn-Clarke use materials such as Alexander palm sheath, rubber tree stipules, linen thread, ceramics, dodder, Date palm inflorescence, Nepalese raw silk & stitched seaweed.